This workshop offers step by step instructions for working with slabs, with or without a slab machine. Jayne will demonstrate simple techniques for producing unique handmade molds, a very exciting part of this workshop. Jayne will show how to use these hump and slump molds and templates, as well as other traditional methods for constructing slab built pottery. Jayne will demonstrate how to use a slab machine, and will also present the use of extruders. This workshop focuses on various techniques of glazing- not the struggles of glaze chemistry. Jayne will demonstrate dripping, pouring, brush painting and multiple glazing methods for unique effects. She also demonstrate how to weigh out glazes from scratch and proper methods of mixing glazes. Participants will bring three bisqued pieces and they will glaze them, taking them home to fire in their own kiln. Jayne will discuss how to fire at cone 6, and where to place their pieces in their kilns. It is important that students fire these pieces in their own kilns so they will develop the skills of firing their own work. Students go home with a handout of both cone 6 and cone 10 glazes. Producing ceramics for the wall is a fascinating art form. Historically, clay has been embellishing building facades and interiors for centuries in the form of tiles. But clay on the wall can be much more than tile work. It is one of the most exciting ways to work in contemporary art. Clay can be hung, draped, and mounted on wood, metal, and plastic. Embedding other materials into the surface of the clay provides enormous avenues of expression. This art form can be viewed as either wall sculptures or three dimensional paintings, and endless possibilities can be envisioned. The work can be displayed like a painting on a wall, making it portable and transferable. The clay can “float” off the wall or appear grounded as traditional tile work. Wall pieces can be made in any size kiln because they are produced in segments. This allows a small studio to produce large-scale ceramic pieces. The same basic techniques are used for large-scale architectural design as well as smaller presentations, such as wall pieces for interior spaces. The technique is demonstrated from the initial creation and planning of a ceramic wall piece to its final mounting and installation. Slides and demonstrations of sculptural hand building techniques are utilized to facilitate learning. A "diagram map" is plotted showing how the design is initiated and how the map aids the artist in recreating the piece after it has been glazed and fired. Discussions on drying, cutting, glazing and firing the piece are presented. The all-important application of adhesives is discussed. This workshop continues with the techniques of tile making with a particular exploration of creating tiled tables. Tables require a specific size and shape as well as an appreciation to their funtion. How to determine the specific size and shape of a table and how it relates to various environments will be examined. Participants will learn how to draw their table top on graph paper, creating a "map" of the piece. Free form pieces will also be explored. The use of a slab machine is preferable to creating these tiles and proper cutting, cleaning, drying and firing will be discussed. Potters want to throw large, but have problems with their techniques. This workshop explores a unique method of throwing large vessels on the potter's wheel in one sitting. Pots that are several feet tall can be created in a few hours. The traditional Japanese method is to begin throwing a pot on the wheel, place twigs and branches inside the pot, and light a fire. The fire firms up the walls, allowing large coils to be placed onto the existing form. The coils are then carefully joined and thrown on the pot as an extension. Another fire firms up the walls and the process continues as before. Instead of the smoke, smell, and apparent hazards of fires, a technique using a small blowtorch purchased at any hardware store is demonstrated. This method is applicable to hand builders as well, enabling them to produce large-scale vessels in a few hours. A demonstration of wedging and centering large masses of clay is also presented. This workshop is extremely stimulating and provides new alternatives to an ancient pottery technique for the contemporary artist potter. This workshop series is designed for the advanced student and professional potter. The approach is one of a philosophical exploration, redefining goals, looking toward future needs as well as mastering studio techniques. Jayne has been producing and selling her work for over thirty years. She has worked in a production pottery studio as well as created design work for private commissions. The workshop examines refinement in throwing, hand building, and sculptural techniques, as well as glaze and firing technology. Master potters need support as they are the advocates of the ceramic tradition. This workshop will provide the necessary tools for self-evaluation and strengthen the potter's commitment to art, career, and personal life. Methods for successful business practices will be discussed. This workshop can be taken in any of the following areas, as each one deserves special consideration for the master ceramist. This workshop delves into the mastery of several throwing techniques. A few forms will be executed that encompass most of the problem areas that potters struggle with in their work. (Bowls, platters, casseroles, teapots, and goblets). The objective of this workshop is to support the continuing potter in achieving their goals of producing high quality pottery. The workshop can be either hands on or demonstration, depending upon the needs of the program. A slide presentation of wheel thrown pottery will accompany workshop demonstrations. This workshop demonstrates several hand-building techniques for the potter. Various forms will be constructed (box, platter, bowl, goblet, teapot), exhibiting the possibilities of the slab, coil, and extruder methods. The slab machine is one of the most available and exciting tools for hand built pottery, enabling the potter to execute work of precision, spontaneity and strength. A demonstration of handmade slump and hump molds will be presented. A slide show of hand built pottery will accompany the workshop demonstrations. This workshop is designed for the manipulation of clay in a sculptural context. Four areas of sculptural techniques will be investigated. Any one of these topics can be presented by itself or they can be combined into one workshop presentation. The techniques of solid form and coil construction will be presented. Coil construction utilizes a combustible armature, employing additive techniques. The solid form will draw upon subtractive techniques that stone carvers use with solid bricks of clay or traditional stones. Demonstrations in relief construction (3 D forms on 2 D surfaces-walls) will be presented with discussions on firing, installation, and adhesives. Several methods for the production of large-scale mural work will be discussed with specific information that pertains to the unique drying and firing needs of mural work. Also a discussion on developing a design for interior and exterior spaces within an architectural setting will be addressed. The utilization of traditional pottery techniques to produce sculptural forms will be presented. Large-scale ceramic construction is the instructor’s area of expertise, and her unique techniques in building these forms will be demonstrated. The historical background of ceramic sculpture will be offered through a lecture and slide presentation. This workshop is designed to provide artists with a strategy for developing the necessary tools for achieving success. This is realized through marketing themselves as well as their work. The most important aspect of the workshop is that the artist will learn how to maintain a positive self-image through successfully visioning the promotion of their work. The workshop deals with the blocks one creates about becoming successful, how to cope with acceptance, as well as rejection. Defining what constitutes success will be a basic theme. The workshop also deals with practical information on creating a successful business. Methods about producing a proper slide portfolio, resume writing, stationery, brochures, advertising, digital photographs, web site design and the potential of the Internet will be discussed. The artist will be introduced to the world of galleries, juried exhibitions, retail, consignment, and wholesale markets. This workshop is designed to provide necessary factual information and to open the artist to recognizing their individual potential toward achieving success. It is beneficial for artists and craftspeople in all media and all levels of expertise. As potters mature and begin to approach their work as a viable means of income, they must enter the business world. The more fluent they are with business procedures that pertain specifically to them, the greater will be their success. This workshop is designed to assist production potters in developing successful business skills. Potters must deal with both the quality of his/her work as well as how to market it, therefore, the workshop will be divided into two parts. Demonstrations on the wheel and hand building techniques to improve the awareness and skills necessary for series production work and the development of a "line" will be presented. This session will enable students to focus their forms into a marketable item. There will also be a slide lecture on series work. This session deals with the practical business procedures of the production potter. Discussions will be presented on the arrangements established with the wholesale, retail and consignment trade markets, emphasizing communication with buyers and art dealers. There will be a discussion on developing a display booth, producing a proper slide portfolio, resume writing, stationery, brochures, and advertising. How to utilize a Web site for promotion and sales will be discussed at length. Also a dialogue on establishing a designer studio with the use of master molds and/or apprentice-produced ceramics will be presented. This workshop focuses on teaching ceramics in a multi-station art room. Many classrooms are scheduled to teach ceramics as well as other art disciplines thus creating unique problems. Discussions on alternatives to glazes for the elementary classroom, glaze making in the middle and high school, and how to challenge the high school student towards high achievement will be discussed. Information on chemical toxicity, health issues, dust maintenance, studio equipment, and ways to maintain a digital portfolio for each level will be presented. This workshop is appropriate for public school art teachers as well as college instructors as the information is important for anyone teaching in a public workspace. A digital portfolio will be presented on CD, ZIP and Floppy formats, as well as ink jet printed copies of student work. This workshop focuses on the ceramic artwork produced during the Prehistoric, Paleolithic, and Neolithic periods. The slide lecture presents artifacts discovered at the first known kiln site, located at Dolni Vestonice, 27,000 BC, which is present day Czechoslovakia. At this kiln site, fertility statuettes known as Venus figurines were produced, possibly by the Shaman of the Clan. A second discovery exhibiting work produced by the Magdelenian artists of 15,000 BC, in the Tuc D'Audebourt Cave, France, shows two clay bisons sculpted from clay that lay on the cavern floor. The discussion culminates with the discovery of the first coil built pot produced in Japan, 12,000 BC, and how pottery evolved due to a shift in societal needs. Influences from pre existing art forms will give evidence to the evolution of coil built pottery. At the conclusion of the slide presentation, the instructor will demonstrate sculpting the Venus figurines. Participants will then work on their own sculptures in candlelight, which will create the feeling of being inside a cave. An extremely important aspect of the ceramic education process is experienced through a chronological survey of the history of ceramic art from 27,000 BC to the present. Techniques from each period are discussed, as well as how several of the periods and cultures relate to each other. The political and philosophical climate of each period is briefly discussed, showing how historical trends repeat themselves and are reflected in a society's art- in this case, its ceramics. The length of the workshop determines the depth of the material presented. This workshop traces the history of Low Fire ceramics from the beginnings of cave art to contemporary times through an extensive slide presentation. Low Fire work was initially produced in the prehistoric Beehive Kilns of the world's first discovered kiln site at Dolni Vestonice, present day Czechoslovakia, 27,000 BC. Venus figurines, probably fired by the Shaman of the Clan, were fired inside a cave in a beehive shaped mud kiln, with an underground flew that exited through a tunnel to the outside of the cave. These blackened forms, fired from bones as the fuel source, began the tradition of "smoked ware," that continued for thousands of years. Low Fire ceramics evolved with each successive era, from the development of coil built painted pottery of the Neolithic period, to the great works of the Ancient civilizations of Egypt, Greece, and Rome. Low Fire ceramics blossomed throughout the world in Asia, Europe, Africa, and the Americas. Each culture cultivated a unique style that contributed to this vast ceramic tradition. The Native American originally migrated from the North, either across the Bering Strait or via a pass-age through the Aleutian Islands. They traveled down the West Coast (now California), and then ventured through the Missouri and Mississippi regions. They journeyed southward seeking a warm climate, then moved eastward across the central plains into the New York and Florida areas. Possibly originating from the Mongolian race, the Native American had brown skin, straight stiff black hair, sparse body hair, and broad facial features. Pottery was produced in the settlements where agriculture and masonry were practiced. The ware was produced by the coil method exhibiting incised symbolic patterns. Afterward, the ware was lively painted using colored clay slips. Through a slide presentation, this lecture presents examples of Native American pottery and the regions in which they were produced. Native American pottery originated during the Neolithic era (3,000-2,000 BC). Through the centuries, their pottery techniques have changed little. Their wares were produced by the coil method with incised symbolic decorations. Pottery surfaces were painted with colored slips that were ground from ores dug from the hillside. Unfortunately, the techniques, history and collection of artwork manufactured by our native potters were becoming a lost art form. President Franklin D. Roosevelt recognized this situation and commissioned New Mexican potter, Maria Martinez to research the vanishing techniques of our Native American potters. The Native American used many interesting firing techniques, from in ground pit firings to quickly constructed above ground kilns created out of mud and bricks. Today the use of metal sheeting and grating is also employed. Through a slide presentation, this lecture demonstrates the coil method of pottery production, provides examples of primitive type kiln firings, and shows how local clays are prepared for their ware. Traditional Japanese folk pottery epitomizes work produced through the ease of unconscious thought. Work was created without judgment and achieved a free flow of artistic energy. The irregular and the asymmetrical characterize the Japanese concept of beauty. Their work emanates from a natural and unconstrained movement, culminating in qualities of strength and aliveness. Thick, bubbly glazes laden with ash, unglazed feet, and uneven rims, are all aspects of traditional folk pottery. As the world expanded, so did the Japanese pottery market. The Dutch West India Company, resulting in the development of mass produced industrial ware, shipped Japanese Export Porcelain throughout the world. The consequence of this was the loss of much of the individualization of traditional pottery. The 20th century witnessed the return of handcrafted work and the emergence of the studio artist potter. This lecture compares the strict classical style of the ancient Chinese tradition with the spontaneity, asymmetry, and irregularity of the Japanese and Korean forms. These traditions provide the backgrounds that demonstrate how a similar situation occurs in our Western contemporary ceramics. We have traditional classical ideals persisting alongside the self-expressive abstract forms of the avant-garde. This workshop offers an historical survey of American pottery from the Native Americans to contemporary times. A discussion of the development of the American ceramic field from traditional primitivism to the competitive industrial art potteries of the 19th and early 20th centuries is presented. It traces the emergence of the Studio Potter and their impact on the field of ceramics, establishing the U.S. as one of the world's leading ceramic centers. 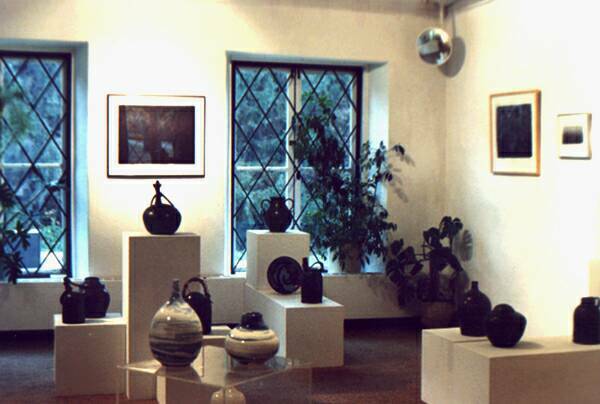 Art pottery is a term associated with the ceramic work produced in a factory situation during the period of 1870-1920. This work was conceived for artistic, appreciative, and decorative purposes, rather than its function. The art potters of this period worked within the structure of a commercial enterprise as the originators of the work as well as the mass producers. The Art Potteries initiated our country's ceramic pursuit, defining the U.S. as a major contributor to the ceramic field. The histories of these potteries provide us with the development of the American Art and Craft Movement. This lecture is composed of fifteen Art Potteries, their philosophies, the individuals most responsible for their success, and examples of their work. This workshop deals primarily with the study of ceramics from the turn of the century to the present (1880-present). The survey focuses upon the Art Potteries of the early 1900's, emerging from an industrial age to the ensuing Studio Potter of the renewed Handcrafted Tradition. The 20th Century is divided into decades, in relation to their political, cultural, and philosophical climate. The period known as "FUNK" originated in Berkeley, California during the early part of the 1960's, influenced by the artistry and comedic satire of Robert Arneson. A time that flourished out of Abstract Expressionism of the previous decades, this precocious new period merged the philosophies of the Surrealists and the outspoken political views of the 60's counter culture. "Funk" evolved into one of the most exciting periods in the field of ceramics, and secured the United States' position as a motivating force in the field of ceramics. This period evolved as the pioneer of our contemporary ceramics. In many primitive cultures, prior to the advent of the potter's wheel and the industrialization of ceramics, coil built pottery was the woman's share of the household duties. Even today, in some “living primitive" cultures, women make the pottery, while the men care for the homestead. Consequently, women have been producing high quality ceramic work for centuries, but have had to be extraordinarily unique in order to infiltrate the male dominated artistic and industrial ceramic field of the 20th century. In Europe and the U.S., women were "decorators" in the art potteries during the early part of the 20th century. This was a respectable endeavor in which women could participate in the ceramic industry as well as a work force. In the United States today, an increasing number of women are on staff of universities and have broken down the “old boys club” in the ceramic field. This lecture historically traces the accomplishments of women ceramists and their prominent position in the ceramic field. Slides showing major works and their influence on contemporary ceramics are presented. This historical survey of the world's ceramic sculpture begins with the ancient Japanese tomb sculptures of the Neolithic period (2,000 BC), and concludes with the work produced in the 20th Century. The techniques of the various sculptures will be discussed as well as the political, cultural, and philosophical environment of each period and how the sculpture reflects the society within which it was created. Potters have developed a variety of techniques to decorate the surfaces of their pots. Their unique processes have enabled them to utilize their artistic skills as painter, sculptor, and drawer, creating wares of considerable interest and variety. This lecture presents ceramic works from 2000 B.C. to contemporary times that are noted for their surface decoration. Exploration of terrasigillata, majolica, carving, the Wedgwood process, printed plates, acrylic and epoxy paints, millefiore, neriage, nerikomi, lusters, decals, raku and salt glazing will be covered. Ceramic works have adorned buildings for centuries. Clay tiles have been widely used for exterior facades, interior walls, as well as city streets. The development of a design was usually accomplished through collaboration between architect and artist. Not only has clay been used in architecture, but also in a sculptural context that relates to a particular environmental situation. The Renaissance family, the della Robbias, produced sculptural wall plaques in the form of majolica tondos (circular reliefs in tin glazed earthenware). As Luca della Robbia switched from marble and bronze to clay, so have many contemporary sculptors. Due to the increasing costs of producing bronze sculpture, many artists have re-discovered the techniques of large ceramic construction for architectural and environmental purposes. This lecture traces the background of ceramics in the environment from ancient times to the present.